Z. E. Serebryakova one of the famous artists of the twentieth century. 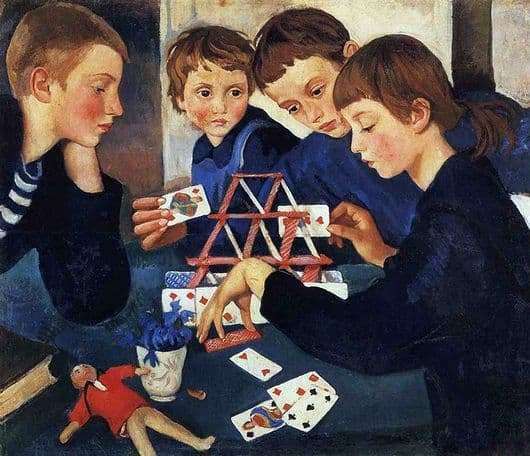 A popular work is the painting “House of Cards”, which was written in 1919. In general, the picture is a group of children who are passionate about building a house from a deck of cards. Admit that you did in childhood? Yes, this is a fascinating and interesting activity. In this work, the artist wanted to convey all the charm and intrigue of childhood, when children start to try something themselves, learn something from their peers. But on the other hand, we see how anxiety and failure in business can be seen on the faces of schoolchildren. Therefore, here we will be able to see the clash of two ideas with which the author wanted to share. Interestingly, Serebryakova decided to depict this canvas in cold shades, but why would it suddenly? After all, it was not at all characteristic of her! Some attribute this to the fact that shortly before writing the work, her beloved husband, Boris Anatolyevich, passed away. Therefore, the woman had to somehow experience this period, just taking all the will into a fist. After all, she had a large family consisting of four children and her old mother. Therefore, the woman and conveyed all his suffering, as well as unfulfilled dreams and plans. All of this was suddenly replaced by a harsh reality. Therefore, in the spirit of writing a picture. All we see are children who are passionate about building a house of cards. All of them quite seriously approached this case, therefore there is tension and perseverance in their facial expressions that will help to reach the end and achieve success. After all, the most dangerous thing is that a lot of effort will be made and all in vain, if it breaks down so simply. In this case, the house of cards represents hope and faith in the best, spiritual welfare, which is not enough. And all this can collapse in one moment. The most important thing is that everything happened in the life of Serebryakova.